Today was Day #3 of Chocolate, Seeds and Berries Theme Week. 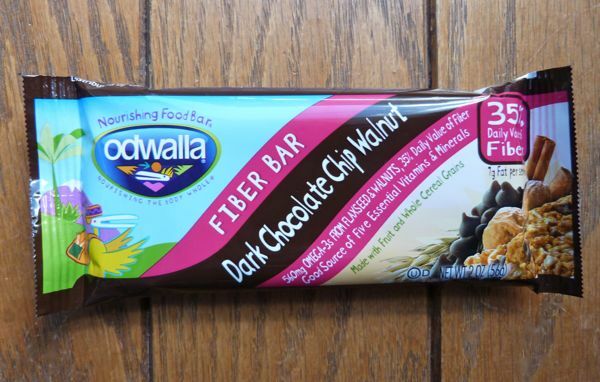 Featured in an all California product line-up today: Dark Chocolate Chip Walnut Fiber Bar from Odwalla, Inc. (Half Moon Bay, CA, with a plant in Dinuba, CA). Also included today as a companion dish: a raspberry yogurt sundae. 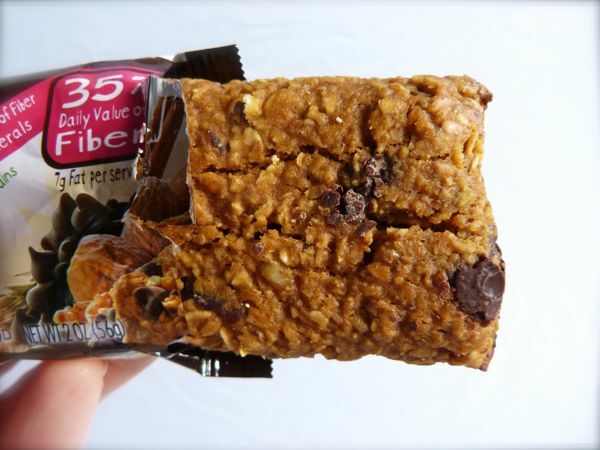 The Odwalla fiber bar was "made with fruit and whole cereal grains." The good news for those eating gluten free: no wheat or barley. The bar is made with plenty of oats (rolled oats, oat fiber, organic oat flour); and it contains flaxseed, as well as plum and date purees. I found it to be chewy, without being too dry. The semisweet chocolate chips took a backseat to the other flavors and textures, which was fine in this case. I enjoyed the fact that the bar was not overly sweet (not too much brown rice syrup). The fiber in the oats left me feeling satisfied. Thank you to Odwalla for their "No GMO" choice on this bar, and for including organic fruits and grains where possible (36% organic ingredients in this bar). 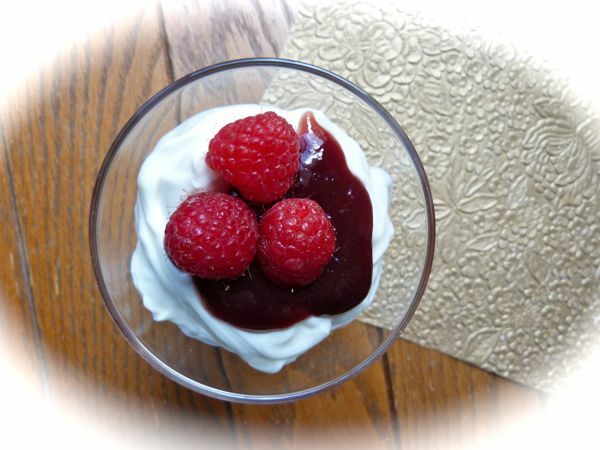 As a complement to this dark chocolate chip bar, I enjoyed a Straus organic, nonfat Greek yogurt sundae -- topped with organic Seedless Red Raspberry (gluten-free) fruit spread from Santa Cruz Organics and a few organic, fresh red raspberries. Who says healthy food doesn't taste good? Note: Odwalla also produces a Berries GoMega juice smoothie, with Omega 3 from flaxseed, (and a Berries GoMega bar), that would be berry nice companion(s) to the Dark Chocolate Chip Walnut bar.